The Braun Series 9 shaver is the World’s most efficient and comfortable shaver*. Specialized shaving technology captures more hair in every stroke, providing a close, comfortable shave without compromises. *Tested on 3-day beards vs. leading premium tier products. Series 9 Wet/Dry Electric Shaver Silver plus Clean&Charge Station & Travel Case is rated 4.6 out of 5 by 241. Rated 5 out of 5 by Tony C from A must have for electric shavers I purchased this shaver about a month ago an have used it every second day since purchase, I use a pre shave oil before using the shaver,I have used many other brand name electric shavers and I have to say nothing comes as close to this one, it gives you a brilliantly clean cut as long as you use a reasonably medium speed to move the shaver and a little bit of pressure at the same time also in the direction your beard grows ,I can’t fault this shaver it has to be the best investment for my face regarding shavers very happy with my purchase . Rated 5 out of 5 by Nic10 from Excellent machine! So far so good. Husband is very pleased with his new shaver. Highly recommend but quite dear. Does this come with self cleaning function? I'm buying this for my husband and want to know that if he is not 100% satisfied then we can get our money back with no questions asked? What are the conditions - forms, reasons/ proof? Hi, yes it does &amp; it&rsquo;s a great shaver I have been using it for 6+ months &amp; have had no issues. I would recommend this to anyone. Hi, the series 9 has a facility of auto cleaned, does it need a special liquid or we can use normal water like tap water? What is the difference between the gold version and the silver version of the Brsun series 9? According to Google gold and silver versions are simply the finish of the razor case. It is the Series full number that determines features such as 9090 CC or 9093 CC. If the number ends with S such as 9095 S then it means the Shaver is supplied without a cleaning unit. Does this include a Clean &amp;Renew cartridge? 1) How often must the blades for this shaver be changed? 2) How long does the cleaning solution lasts? How much does it cost? 3) I am living in Orange, NSW. Where can I get the cleaning solution? Hi, I am just enquiry where I can get more cleaning solution for this shaver. 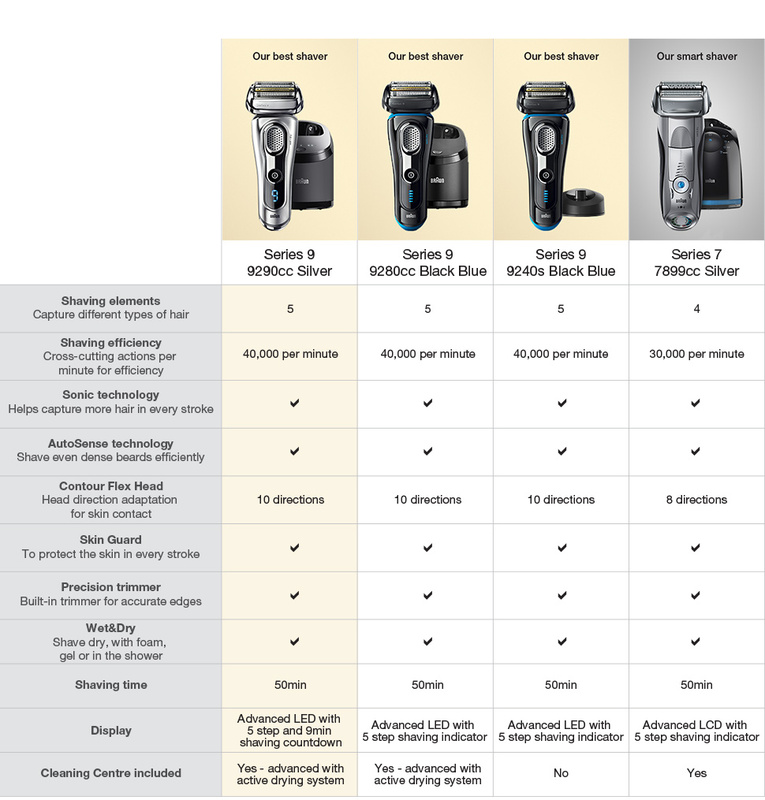 What is the Braun shaver series 9 like? I've had this shaver since October last year. I have always had Braun Shavers. This one is different to the others, different foil, different power cord etc. It is good but not fantastic. It also consumes the cleaning solution very quickly. My previous Braun Shavers would use a container of the cleaning solution a month if I cleaned the shaver every day. With the Series 9 I am lucky if the solution lasts three weeks. Does the braun series 9 9290cc come with an Australian Plug type? or does it come with a converter? Should I be able to make the multiheadlock switch work on my series9 clean &amp; charge model work or is it permanently positioned with the head always able to move? Can the head be put into a fixed position? Yes. there is a sliding switch just above the on / off switch alongside the wet or dry label. I like to shave my head, i have been using a razor for 10 years, but its awkward. ....is this shaver suitable or do you have better options ? The silver switch is to lock the shave head in place ie not to move when you shave. Just wondering if this comes with any attachments to enable you to have small stubble, Or is this just clean shave. No attachments but has a pop up trimmer that is pretty good. I don't know how it would go on facial growth but great for neck and sideburns. Can I also use this device for trimming a light beard or shave and leave a slight shadow? Hi Phil,&nbsp; No I don&rsquo;t have replacement blades &amp; I don&rsquo;t require them at this stage. Why you ask? Braun gold edition is a limited edition model that is only available while the stock lasts.That is the difference between the Braun series 9 at $499 and Gold edition at $799. The Colour and metallic finish. That's it. what is the model number of this Braun 9 Series shaver? Do you provide Tax invoice and deliver to the address with the shaver together? I would like to get the tax refund as I am going overseas. Thanks. Why does my new braun series 9 have the charge bar display instead of the number display like on the box etc ? Does the new Braun Series 9 shaver fit into the Series 7 charging and cleaning station? Sorry, not sure. Instructions for Series 9 Shaver only mention some models come with the charging and cleaning station. I am guessing you would have to check the shaver head size on the Series 7.